It's that time again-the season of gift giving. For me, it brings back memories of when I moved to Azerbaijan three years ago ready to get involved, to give something of myself to help build a future, especially for the youth of this country. In the process, I think just living here has turned into the one of the greatest experiences of my life. Azerbaijanis have given me a greater gift than I could ever hope to give them. 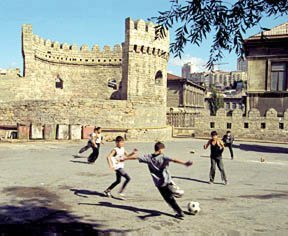 Photo: Everyday scenes inside the fortress walls of Baku's "Inner City" (Ichari Shahar). I am continually amazed that people who have so little themselves have such an enormous capacity to give so much. Recently, I found myself in an emergency. My landlady, it turns out, had sold my apartment out from under me. It was a misunderstanding, of course. But that didn't solve the problem. I needed help. In America, where self-reliance is a virtue and asking for help is tantamount to admitting failure, I probably would have kept my problem to myself. But here everyone knows that you can't survive on your own. We need each other-or as the saying goes, "We're all in this soup together, so let's make the best of it." And sure enough, people did reach out to me, helped me find shelter and even offered me money until I got myself reorganized. Such is the bond that exists here. I'm learning to admit my needs and my inadequacies and, in turn, have experienced the power and safety inherent in the great bonds of friendship. There are so many hardships to deal with here on a daily basis. I always marvel about how unfazed Azerbaijanis are when confronted with such obstacles day after day. Last weekend, for example, we were without electricity in our apartment for 17 long hours. Usually when the electricity goes off, it's due to malfunctioning, worn-out equipment. Left: The Government House where the Ministry offices are located. The building was constructed by the labor of German prisoners. Generally, you can count on the problem being fixed in five or six hours-more or less, maybe. But last weekend, the power was out for what seemed an eternity. The night was so cold without heat and I couldn't bear the thought of having to wash in ice cold water. In addition, the freezer compartment of the refrigerator kindly obliged and defrosted itself throughout the night, a welcome gesture at any other time, but it just so happened that I had bought some chicken breasts and was hoping to save them for a special occasion. Oh, well, as they say, "when life hands you lemons, make lemonade." But when life hands you defrosted chicken, does that mean you're supposed to make fajitas? One of my neighbors had just been given some shrimp brought in from Dubai, so there she was at 3 o'clock in the morning having a shrimp fry. The ability to be flexible and improvise is another gift I'm learning to treasure. Sometimes at the public school where I volunteer once a week, it's so cold that we all sit there in class with our coats and gloves on. I can't help but admire the determination of these kids who don't have to attend these classes. They come simply because they want to learn English. They're eager to connect with others and explore a big world. They find life so interesting-in spite of the cold, and that's what makes their hearts warm enough for all of us. What I like about Public School No. 41 is the openness of the kids. When I arrive, I walk across the yard and they recognize me immediately as the "inastranka"-the foreign lady. The little ones always run towards me-though not quite daring to approach me-just coming close enough to get a good look, sometimes hiding behind a tree or an older, taller child. And then I'll hear them say, "Hello, have are you?" (I guess that's what "how are you" sounds like to them!) They are so shy. I try to engage the little ones but they run away. However, it doesn't take long before a small crowd gathers around proudly repeating the few phrases they know in English. I was shy like that, too, when I first came to Azerbaijan. I didn't want to make mistakes or appear uncultured. Education is so highly prized here. It didn't take me long to realize that many can recite lengthy selections from poetry including the world's greatest literature. They know the likes of Shakespeare, Tolstoy, Hemingway and many others including their own poetic geniuses such as Nizami and Samad Vurgun. On several occasions, I've been asked why Americans don't know Theodore Dreiser, "one of the great novelists" as they call him. The fact that he was also a Socialist at a time when such an identity was highly suspect in America explains why most Americans aren't familiar with his works-but that hardly justifies it all. In Azerbaijan, knowing more than one language is considered fundamental to a good education. Many Azerbaijanis speak Azeri and Russian plus English and an additional "foreign" language such as French or German. In addition, they can usually communicate well with people who speak Turkish due to its similarity to Azeri. "What do you call a person who speaks three languages?" The answer: "Tri-lingual." "Well then, what do you call a person who speaks two languages?" "Bi-lingual" obviously. "And what do you call a person who can manage to speak only one language?" "An American!" Azerbaijanis, on the other hand, consider themselves uneducated if they don't know several languages. Many families sacrifice hard-earned salaries to hire private language tutors for their children. This openness to other languages and other points of view is a joy to behold-a gift, indeed. They still hold out hope for me, though probably not much, that someday I will master the intricacies of their language. They tease me, saying, "You expect us to learn English from you, so you should learn Azeri from us!" Fair enough. "Buyurun" (if you please). When it comes to national dances, my friends encouraged me to learn and I soon discovered that it was something that I love dearly and feel fairly comfortable about in this new culture. Azeri dances are so much easier to learn than the Azeri language. On many occasions, I've joined a large group of people-young and old-clapping rhythmically as one person after another moves into the center ring, "the spotlight," to dance alone. These traditional dances are so graceful and at the same time, even seductive, full of eye contact and smiles, beautiful fluid hand movements combined with quick footwork around the floor. They can be joyful, flirtatious, soulful and exhausting-the music just keeps playing as long as the dancers are willing. At a recent wedding the father of the bride invited me to dance with him, and we were out in the middle of the floor a full 10 minutes before I realized no one else had any intention of joining us. Nor was the music ever going to end! There I was in the middle of the dance floor making a spectacle of myself. 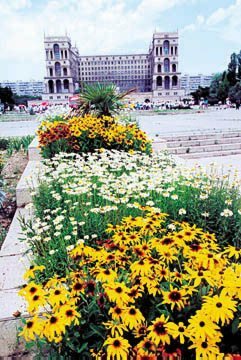 The Azerbaijanis seemed proud that a foreigner was enjoying their culture. They took it as a gift to themselves that I was enjoying their dancing so much. To me, the greatest gift has been their willingness to embrace me as a foreigner and love me these past three years. In Azerbaijan, it seems the season of giving is not confined to a few days at the end of the year. Giving of oneself is quite in vogue all year round. And it's this generosity that has made an immense difference in my life. Jonelle Glosch is the founder of Azerbaijan Business Services which since its establishment in 1997 has trained more than 250 students in English and modern office skills.